Abstract: Contemporary Information Systems graduates will be more marketable in the workplace upon graduation if they have combined competencies in both technical and soft skills: interpersonal communication, teamwork, time management, planning and organizational skills. Team and project-based learning can be used to incorporate soft skill competencies with technical skills. 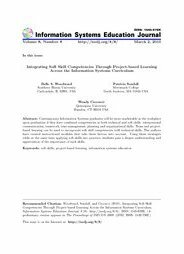 The authors have created instructional modules that take these factors into account. Using these strategies while at the same time applying soft skills into practice, students gain a deeper understanding and appreciation of the importance of such skills.